East Texas (KLTV/KTRE) - Here’s the weather where you live. Strong to severe thunderstorms developing along a strong cold front this evening. Currently the strongest storms should stay contained within central and northern counties late tonight into early tomorrow morning. The greatest threats associated with these storms are damaging straight-line winds, and hail. 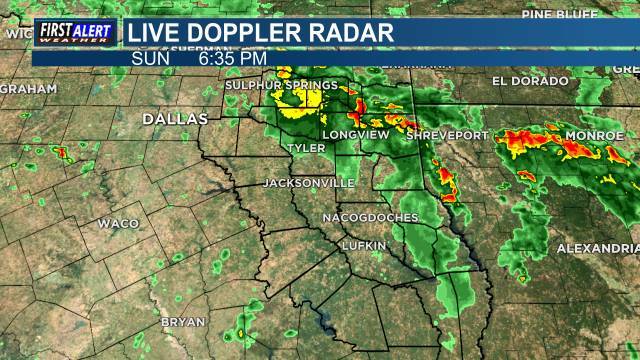 As we have seen this evening, these storms are also capable of producing tornadoes so we will be keeping a very close eye as these thunderstorms pass through East Texas. Behind the cold front, we will see lows dip into the middle to upper 40s for our northern counties and lower to mid 50s for central and Deep East Texas counties. On top of the chilly temps, we will also continue to see persistent rain throughout the area for the next few days with our northwestern counties possibly receiving upwards of 2-4 inches throughout Wednesday. Rain will take a slight break on Thursday before ramping back up on Friday and Saturday as temps slowly warm back up into the middle to upper 60s.